Gabriel Allon is back in Daniel Silva’s latest novel. Kerry Hammond is here to tell us about it. 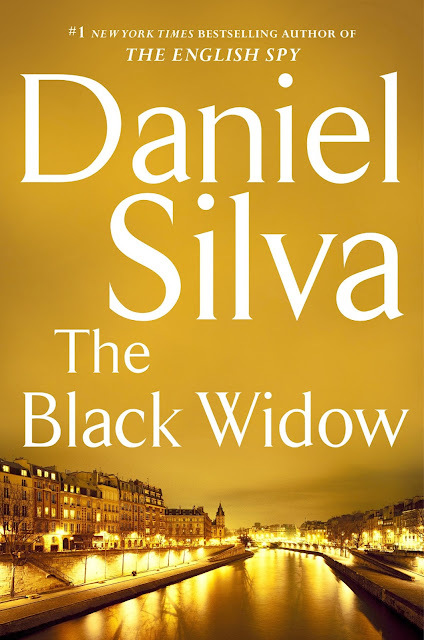 The Black Widow is the 16th installment in the Gabriel Allon series by Daniel Silva. It released on July 12, 2016, from publisher Harper. I am a big fan of Gabriel Allon. I have read nearly all of the books in the series, and my mystery book club Crime & Beyond has even read some of the books as a group. I was drawn to the newest book in the series because it has Allon dealing with ISIS, a current and very real threat, not only in our country but across the world. Gabriel Allon’s passion is art restoration and he often agrees to take on work in that field to lose himself in the beauty of it. Perhaps this beauty makes the other work he does easier to handle. Allon is a spy and an assassin. Most recently he has agreed to become the new Chief of Israel’s Secret Intelligence Service, what they refer to as The Office. Before he can start his new position, a bomb goes off in Paris and the credit is claimed by ISIS. Gabriel agrees to postpone the new job to track down a man who is known as Saladin. This man is not only responsible for the Paris bomb, but promises to detonate many more across the world unless Gabriel and his team can figure out who he is, hunt him down, and eliminate him. Silva’s books are engrossing. Even when they're read out of order or after a period away from the characters, it's easy to jump right in and follow along. Don’t let the 500+ pages scare you away. That isn’t to mean that these books are a light read. They are full of intrigue, war, political turmoil, and a gray line between right and wrong that can make the reader question their own beliefs. The author has an ability to draw you into his story as he takes you from place to place to follow the action, from Jerusalem to Paris it Amman. Without realizing it, the reader is also learning so much about the history and culture of the Middle East. If only our high school history lessons were as entertaining.